As a faith based service, Anglican Trust for women and children believes every person matters, not because of the work they do, not for how hard they try , but because of their common humanity. 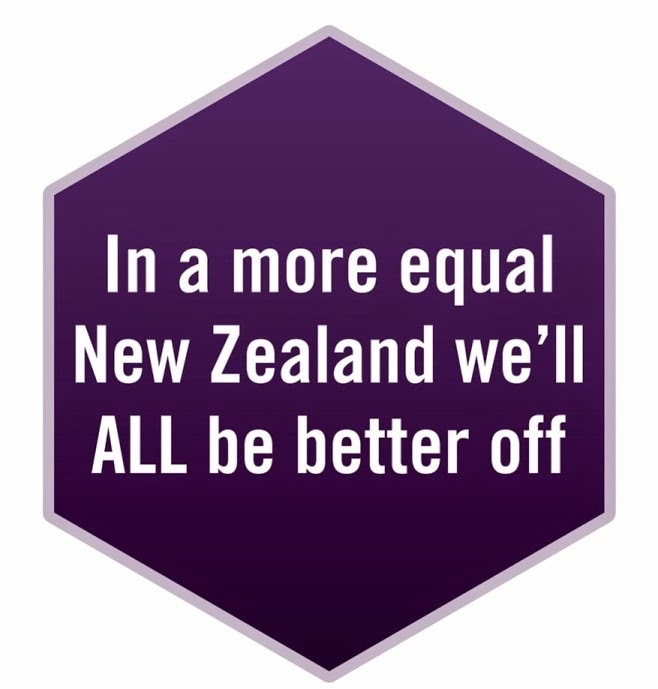 NZCCSS is unapologetic about wanting a more equal society. The evidence is clear: more equal societies do better, and there is plentiful evidence on the Whakatata Mai (NZCCSS) and Closing the Gap websites. The two groups got together at Mangere's Nga Whare Wātea Marae with a whole lot of others last week. Campbell Roberts from The Salvation Army has a wonderful way of producing gut level messages: ‘middle-class New Zealanders gain from the country's low minimum wage of just $13.50 an hour every time we buy a coffee from a low-paid cafe worker’. Ughhhh. "But the worst poverty is not hunger and homelessness, but the poverty of being unwanted, unloved and uncared for." He went on. We obviously don't care about Māori wellbeing - "Māori children are 23 times as likely as Europeans to get rheumatic fever because of cold, damp and overcrowded houses. A quarter of all male Maori spend time in the Corrections system." We don’t care about Pasifika wellbeing either, with "Pasifika children 50 times as likely as Europeans to get rheumatic fever." Fund tax breaks for poor people from higher taxes on middle and higher earners. Have a universal child benefit. The house building programme could be on its way. Housing is a bit of an on-going saga. But Government has announced it is doing something. The something includes a development at Hobsonville Point. “Twenty per cent of the 2500-3000 new homes at Hobsonville Point will be priced at $485,000 or less.” “This means 500 to 600 more affordable homes will be built in this Auckland development alone,” according to Minster Heatley. It also means 80% will be more than $485.000, and way too expensive for most. We know having a decent home provides a basis for so many other things in life. Because people use housing as their number one investment activity, that means house prices get pushed up, wealthy people buy more of them, and others can’t afford them (see cartoon) . Tapu Misa has been looking around at what’s going on. First, housing accounts for just under 96 per cent of New Zealand households' wealth - up from 74 per cent two decades earlier. So housing is a big part of our national debt rather than spending too much on welfare benefits etc. She points to a 2011 OECD report; the tax bias favouring property has led to an unhealthy savings-investment imbalance, and "widening inequalities in the form of larger homes for those who can afford them, but deteriorating affordability for the rest of the population". Underneath all the squabbling about the Labour leadership is some real changes proposed in the housing department. Labour is promising a programme called Kiwibuild which plans to put 100,000 families into new affordable homes within 10 years. "We will also deal with poor quality rental housing by requiring landlords to bring their properties up to minimum standards in terms of insulation and efficient heating." It aims to build 10,000 houses a year by the end of Labour's first term in office. Not only is the plan designed to provide places to live. It is also designed to provide jobs with Labour estimating it will generate $2b in economic growth and provide apprenticeships for 2000 workers. Associate Minister of Health Jo Goodhew launched CarersAir, a new online space for family carers to watch, listen, read, share, and learn. CarersAir has been developed by Carers NZ with support from a range of public, private, and community partners, and will automatically update carers about topics of interest every time they visit the portal, saving their 'favourites' for regular viewing. At CarersAir, they will be able to request Carers NZ’s free resource packs, and download the Government’s popular Guide for Carers. They will also be able to ‘watch and learn’ how to care safely, or follow along to exercise and wellbeing programmes developed just for them. CarersAir also includes ‘virtual respite’ breaks for carers who can’t physically have a break away from home, but may have time for a short filmed ‘getaway’: people watching at a Paris café, a seaside walk, lying beneath a tree in the sunshine. Maybe it’s the pohutukawas beginning to flower heralding the ‘silly season’ in popular parlance. Maybe that is why we acclaim the rights of the child on the one hand, and reduce incomes of some of our most impoverished families on the other. About now we celebrate 23 years of the United Nations Convention on the Rights ofthe Child including clause 27 providing for “a standard of living adequate for the child's physical, mental,spiritual, moral and social development”. UNICEF (NZ) is calling for children’s best interests to be be at the heart of all legislation, policy and operations in both central and local government. We are falling over ourselves doing our best for children most at risk of abuse (MSD has about 10 fact sheets ), we just don’t seem to be interested in helping our children live in adequate circumstances. Meantime the Green Party is pretty cross Peter Dunne opposed their Income Tax (Universalisation of In-work Tax Credit) Amendment Bill because his single vote could have sent the Bill to the Select Committee where a real discussion on how to end child poverty could have been held. Peter Dunne explains he wants a real incentive for families to be in work. NZCCSS notes "United Future wants New Zealand to be the best country in the world in which to live and raise a family" and Peter Dunne pledged support to the Whakatata Mai Reducing Inequality campaign. Are We Looking at a Policy Induced Recession? Government is announcing it has even less to play with. Info on the government’s balance sheet shows in the three months to 30 September the operating balance before gains and losses (OBEGAL) deficit, ($2.1 billion), was $449 million higher than forecast. Low wage growth and low private consumption (less GST) led to lower than expected tax. Maybe lower demand for goods and services is part of the reason for lower than forecast corporate tax. If the last bit is true, then it all starts to look like a policy induced recession. Low demand means less job availability, and sure enough the latest Household Labour Force survey shows unemployment has risen to 7.3 per cent – the highest level since 1999. There have been 3000 public sector jobs have been lost to government budget cuts. And in the year to June redundancy payments cost almost $39 million. Unemployment does not fall evenly. Young people,Pasifika, and Māori get the worst of it. There are around 300,000 jobless people. One in four of our young people aged 15-19 is unemployed. Maori and Pasifika unemployment is around 15%. Best education system for Māori and Pasifika? Te Ururoa Flavell (Māori Party) said: "All that Ms Longstone (Secretary for Education) has said is that the system is still under-performing for Māori learners and Pasifika learners and learners from communities with significant social and economic challenges.” … The percentages of Māori (57%) and Pasifika (65%) 18 year olds who have achieved NCEA Level two are way down on the total figures (74%).” “Putting it another way, the proportion of young New Zealanders aged 15 -19 years and not in education, employment or training is much higher for Māori (14%) and Pasifika (11%) than the total population (8%).” “There’s no other way of dressing this up. The system performs unequally for certain groups of New Zealanders – so in that respect we can not claim to be world-leaders. Community funding rounds - The Community Development Scheme(CDS) supports community, hapū, iwi, Pacific and ethnic groups to work together, generate their own solutions to local issues, and work towards becoming more self-reliant and resilient. Applications close early next year.